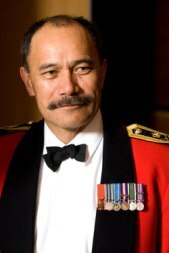 In 2008 the University of Waikato bestowed a Distinguished Alumni Award on Lieutenant General Sir Jerry Mateparae in recognition of his exemplary career in the New Zealand Defence Force, and his contribution to the military and wider New Zealand community. In 2011, he was appointed New Zealand's Governor-General. Sir Mateparae graduated from Waikato in 1996 with a Master of Arts with Honours in international relations and strategic studies. He was both the youngest and first Maori - of Ngati Tuwharetoa descent - to be appointed as Chief of the New Zealand Defence Force and is the second Maori Governor-General after Sir Paul Reeves in 1985. During his military career, Sir Mateparae commanded two multi-national peace support operations as Chief Observer with the United Nations Truce Supervisory Organisation in Southern Lebanon, and Commander of the Combined Force Truce Monitoring Group in Bougainville, for which he was awarded the New Zealand Order of Merit. Sir Mateparae was the Joint Commander for New Zealand Forces in East Timor before becoming Chief of Army in 2002. In 2006, he was promoted to Lieutenant General and became the Chief of the Defence Force and later headed the Government Communications Security Bureau. He has a reputation within the Army as a soldier's man; fair, consistent and a straight shooter. His commitment, persistence and pursuit of excellence have made him a leader in this country and internationally, and he is widely respected for his personal blend of people skills and operational efficiency. Sir Mateparae replaced Sir Anand Satyanand on August 31 2011, beginning a five-year term as New Zealand's 20th Governor-General.